For the last six days, The Salvation Army of Marshalltown has been operating without a functional headquarters building. 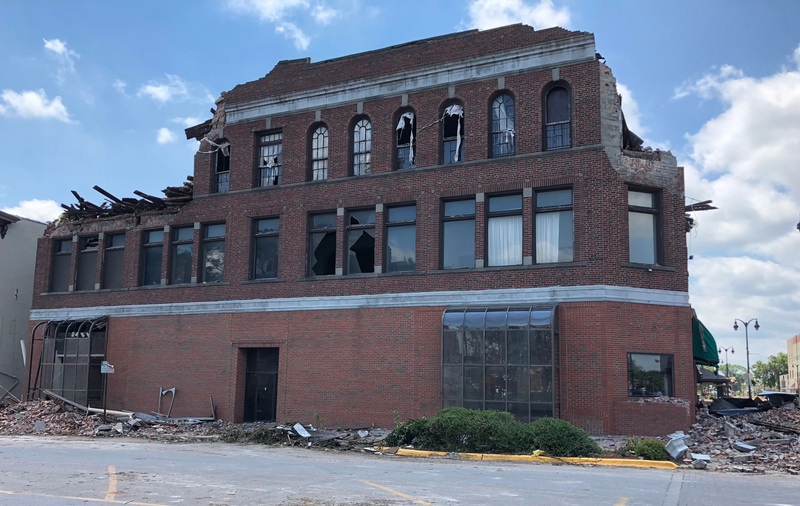 The worship and community center was damaged in Thursday’s storm in which an EF3 tornado struck the heart of the downtown area. Among the other damaged parts of the headquarters building is the roof, which staff hopes to shore up as soon as possible. Structural engineers are set to begin assessing the building for safety. The goal is to have the facility reopened later this week. But all that damage hasn’t stopped Kasten, her staff and a group of volunteers from providing much-needed relief services in the wake of the storm. Tuesday saw more area families seeking help. Salvation Army officers, staff and volunteers served 353 meals, provided 178 snacks, and handed out 717 bottles of water on Tuesday alone. All told, the organization has now served over 15,500 meals and provided emotional and spiritual care to more than 420 people. On Tuesday, nearly 100 families received assistance from The Salvation Army through the Multi-Agency Resource Center (MARC), a one-stop shop set up for multiple relief agencies inside Marshalltown High School. Salvation Army representatives are on hand there again Wednesday. Plans call for the MARC to be open until 6 p.m.
Kasten received praise from The Salvation Army Western Division's leadership. Major Lee Ann Thompson, who traveled to Marshalltown from Omaha this week, surveyed the damage alongside Captain Kasten, and lauded her relief work. “Through it all, Captain Kasten has kept the needs of the community at the forefront by making sure needs are met and people are being served." "Recovery will take weeks, months and perhaps years, but we are committed to helping until that very last need is met,” Major Lee Ann added. In addition, a motorcyclist group from Hope City Church in Waterloo, Iowa, rode into Marshalltown Tuesday to deliver a significant monetary donation for The Salvation Army to assist with disaster relief. They also joined Captain Kasten in prayer for the entire Marshalltown community.